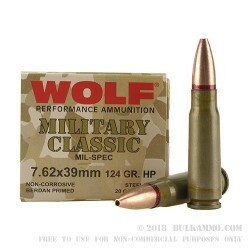 An ideal replacement for that 7.62x39 bulk ammo you shot from decades ago. That lacquer color and the red throat sealant as well as the reliable performance that you had come to expect from the cheap ammunition that seemed to be the best deal on the planet for many years – that’s available again from WOLF in the form of this load. It’s ever so slightly different with a 124 grain projectile and a non-corrosive build, but it performs every bit as good as the best ammunition from that era. It’s incredible how easy this ammunition is to love and that may be a function of the great partnership between the firearms that shoot it and the ammunition that was developed for it, but it’s also an indication of the level of quality that this round is manufactured to. It closely resembles both aesthetically and functionally, the ammunition it replaces as a non-corrosive alternative, and loses nothing of value in the process. The price point of the case lot is an incredible value. It is a case that has non-reloadable cartridges for all intents and purposes though, so you must factor that in. The 124 grain hollowpoint is an admirably performing deer projectile and this is a great cartridge to use for such a purpose.